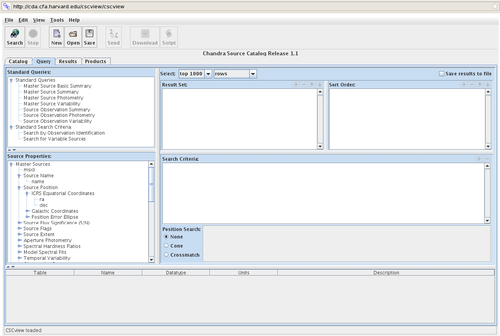 The Chandra Source Catalog (CSC) may be searched using CSCview, a Graphical User Interface (GUI) application, or directly from the Unix command line using the CSC command-line interface. 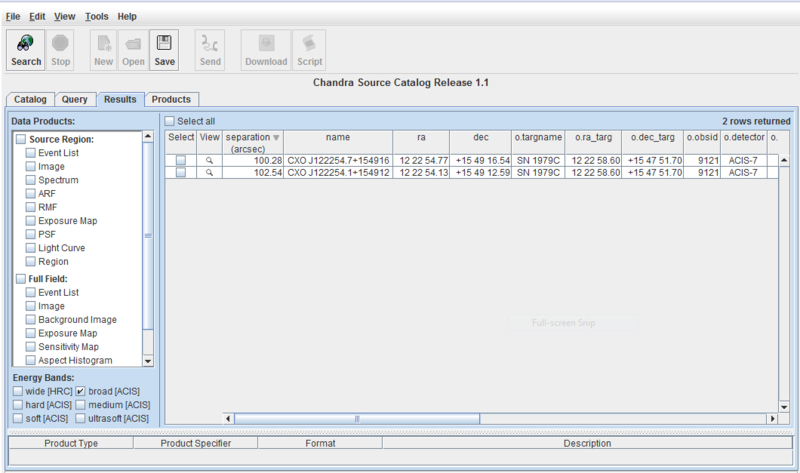 In this thread, we explore the options available in CSCview for locating a particular point source in the catalog. Please note that highly extended sources - those greater than approximately 30 arcseconds in extent - are not included in the current release of the catalog. I cannot find my source in the catalog - why? 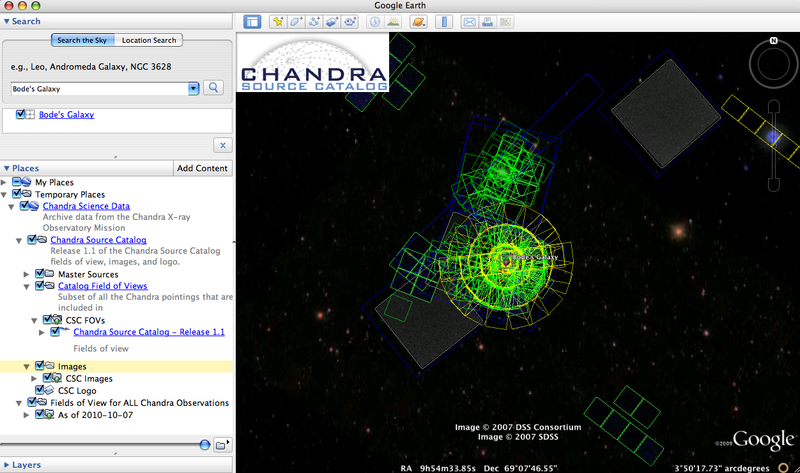 The CSCview application may be accessed from the blue navigation bar situated along the left side of the CSC homepage (and many pages linked to it), within the Chandra X-ray Center (CXC) website. Clicking the "CSCview" link on the CSC homepage will take you to a page where you can either launch the application in a separate web browser window or access the downloadable application. Please ensure that your web browser is Java-enabled and set up to run Java version "SE 6" (1.6) or higher; you can check your current Java configuration on the Sun site. Mac users: CSCview is no longer supported on OSX 10.4, and OSX 10.5 uses an unsupported version of Java by default, though it is equipped with Java SE 6; you can change the default Java version in Applications -> Utilities -> Java Preferences. Linux users: There are special instructions to follow for those using a default installation of the Linux operating system who find they do not have support for Java applets. The CSC website contains instructional threads and help documentation to assist you with accessing and manipulating the tables of CSC source data and data product files output by CSCview, as well as detailed information on all contents of the catalog. In the Query tab, you can select one of the "standard queries" designed by a CXC scientist for various types of scientific analysis, or you can build a custom query more suited to your needs. In this thread, we consider the various ways in which to build a custom query to search the catalog for one source: by source name, source coordinates, or observation identification (ObsID). 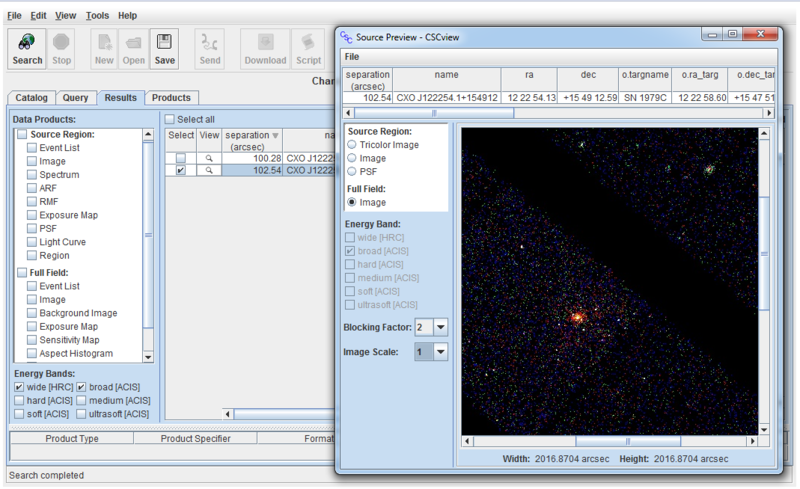 The CSCview Crossmatch feature is available for searching the catalog for many sources at once; refer to the CSCview Help page for a detailed explanation of this functionality, and the CSC science threads to view an example. 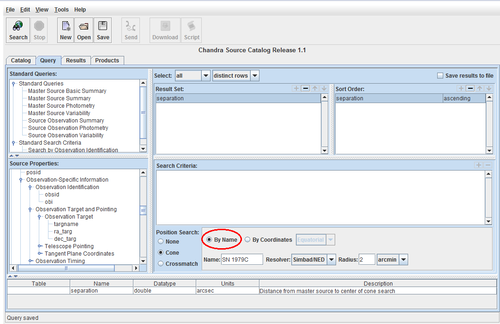 To search for a CSC source by source name, locate the "Position Search" window in the lower-right corner of the Query tab, click the "Cone -> By Name" option, and then enter the source name in the "Name" field. The "Resolver" option allows you to specify which astronomical database to use to resolve the source name and find its coordinates, either SIMBAD or NED, or both. Specify in the "Radius" field the angular distance within which to search around the source location for CSC source matches; this field accepts values in arcseconds, arcminutes, and degrees. 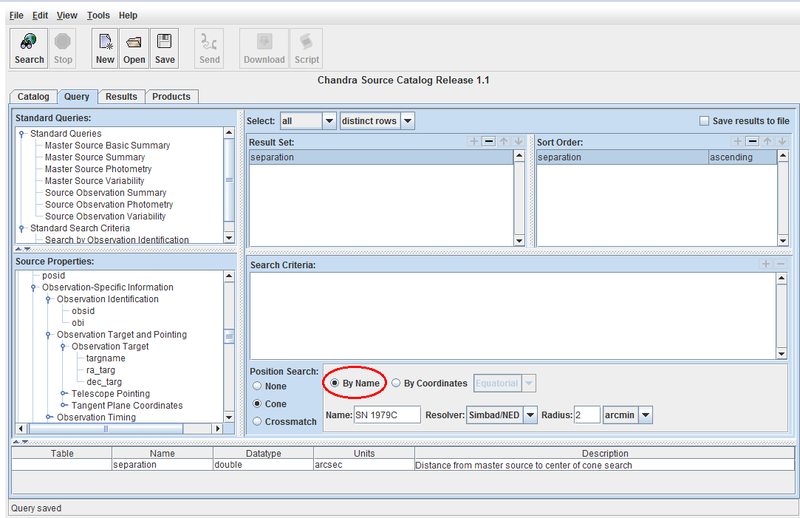 To search for a CSC source by source position, locate the "Position Search" window in the lower-right corner of the Query tab, click the "Cone -> By Coordinates" option, enter the source Right Ascension and Declination in the "Ra" and "Dec" fields, and the "Radius" within which to search around the entered coordinates. RA and Dec coordinates may be entered in either decimal or sexagesimal format, and the search radius in arcseconds, arcminutes, or degrees. 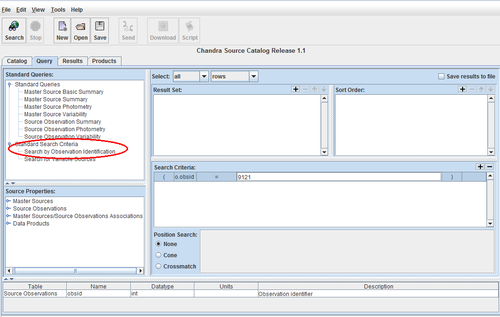 To search for a CSC source by Chandra ObsID, locate the "Standard Queries" window in the upper-left corner of the Query tab, select the "Standard Search Criteria -> Search by Observation Identification" option and drag the selection toward the right side of the Query tab to automatically populate the appropriate search fields. You can also select the option, then click the "+" sign in the upper right of the search field. Enter the desired ObsID value in the "o.obsid" field in the Search Criteria window. At this point, any other search restrictions should be entered into the Search Crieria window, using the CSC source properties provided in the lower-left corner of the Query tab. For example, in order to return only those source matches which are not saturated or piled up, and which exhibit at least 150 net counts in the CSC broad band (0.5 - 7 keV), you would select the "sat_src_flag","pileup_flag", and "src_cnts_aper_b" items from the "Master Sources" list, add them to the Search Criteria window, and set their respective values to "FALSE" and "150". This is shown in the figure below. 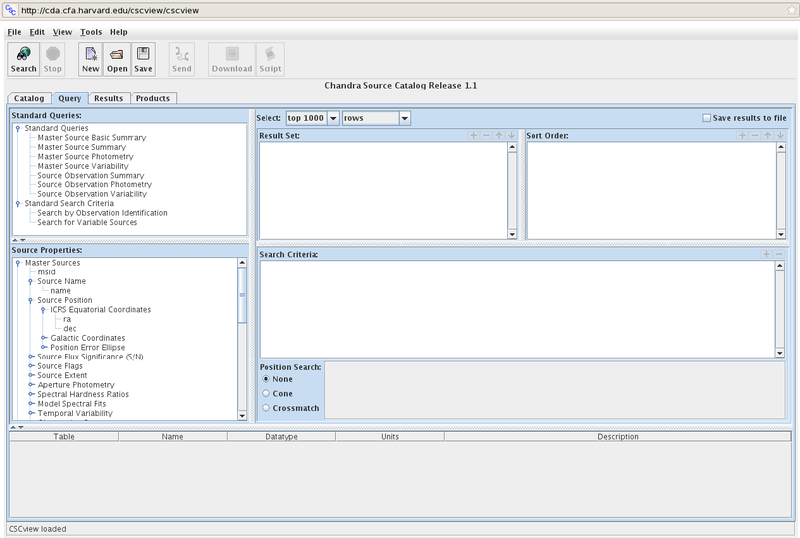 In order to complete the CSCview query, add to the Result Set window the names of the properties which you would like returned for each sourch match, e.g., source flux in all CSC energy bands, source position and extent, source variability measures, spectral model fit parameters and fluxes, and so on. 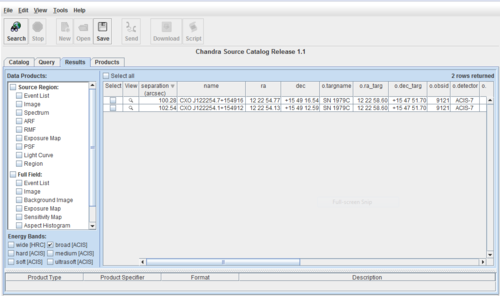 Brief descriptions of each source property contained in the catalog are provided in the metadata display situated at the bottom of the CSCview Query tab, and the full source property descriptions may be found on the CSC Columns pages. 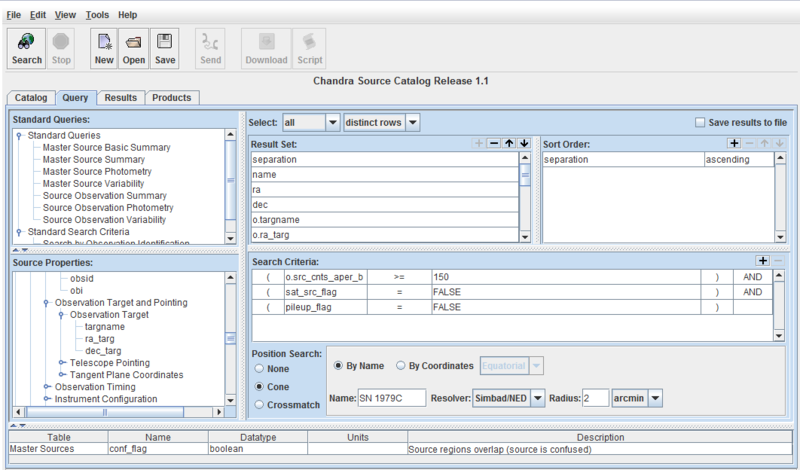 The completed query is shown in the figure below, where you can see that of all the available options for locating a particular source in the catalog, we have chosen to search on source name. This query may be saved with the File->Save menu item, and submitted with File->Search. If your source was located by the catalog query, a table of search results will appear in the Results tab, where you can save the data to a Tab Separated Values (TSV) or VOTable format file, as well as browse the data products available for your source. 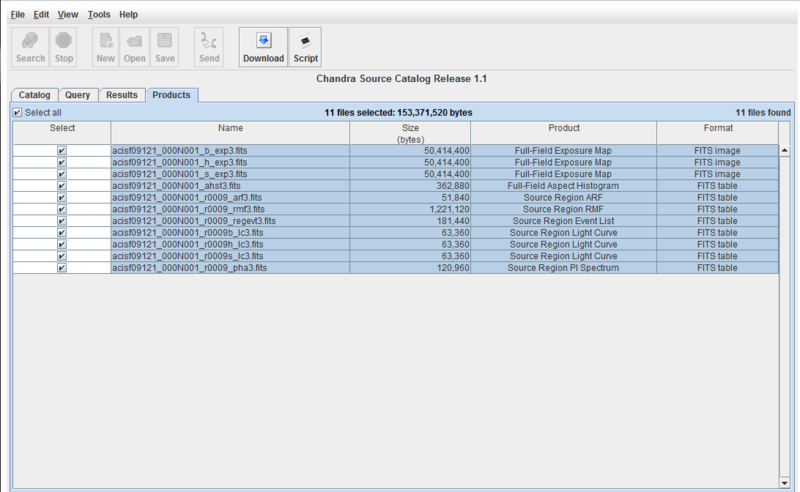 After making data product selections in the Results tab, they may be downloaded from the Products tab. The table of search results returned in the Results tab will contain as many rows as sources located by the query, and one column for each source property entered into the Result Set of the Query tab. 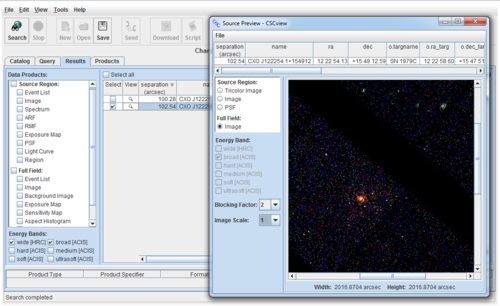 The "View" button in each row of the table is available for previewing images of the associated source, including source region event and PSF images in any CSC energy band, as well as a full-field broad-band image at various blocking factors (i.e., resolution) and image scales. 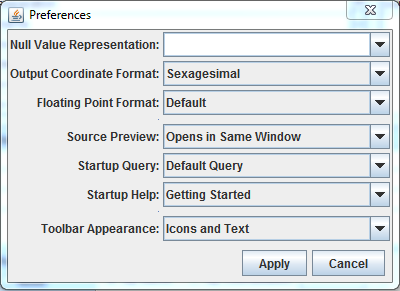 The format of the data contained in the results table, e.g., output coordinate format, may be specified using the available options in the Edit->Preferences menu item. 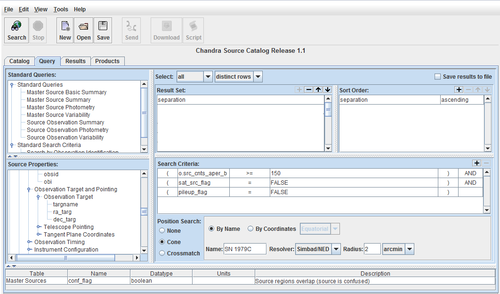 Along the left side of the Results tab is the full list of data products which are available for each source in the CSC. 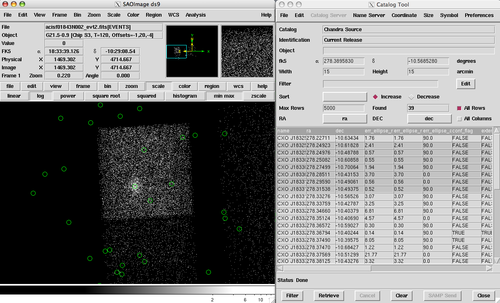 These include source region and full-field event files and images, spectral PHA data and ARF and RMF instrument responses, lightcurves for timing analysis, among others. 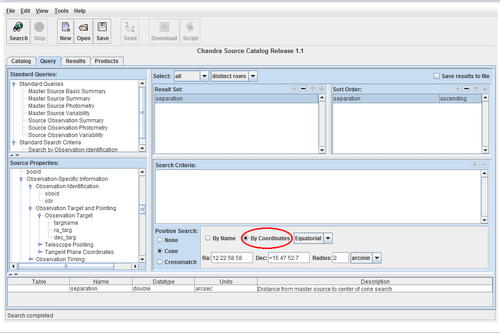 Brief descriptions of each CSC data product are provided in the metadata display situated at the bottom of the CSCview Results tab, and full data product descriptions may be found on the CSC Data Products pages. To download data products for your source, select the row(s) of the search results table corresponding to your source, the desired products, and then "Search". This will open the Products tab with a list of the selected data products. Here, you can download some or all of the data products to a single tar file, or you can generate a Wget download script which can be executed on the Unix command line for a batch download. 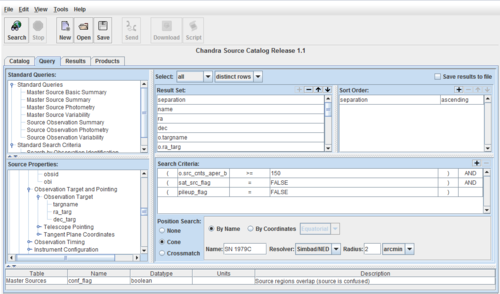 If your source was not located by a CSCview query, there are several resources available to you to help you understand why your source may have been excluded, or to help you build a better query in the event that the source is in fact included, but the search criteria were too restrictive. The full list of reasons for why a source may not be included in the CSC can be found in the CSC FAQ pages, with the most common culprit being that it is not considered to be a point or compact source, or it resides on the same portion of an observation as a highly extended source, in which case it would be located on a so-called "dropped chip". 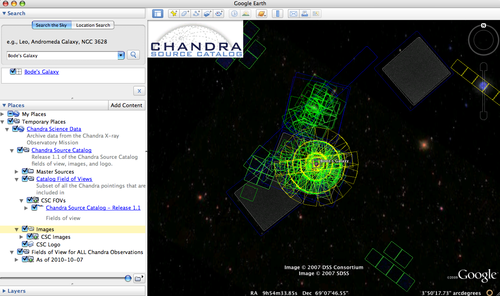 You can search the list of ACIS CCDs dropped from CSC observations, by ObsID, here, or visualize the included portion of the Chandra field-of-view on the sky using the CSC Google Sky interface (see the Further Resources section for details). 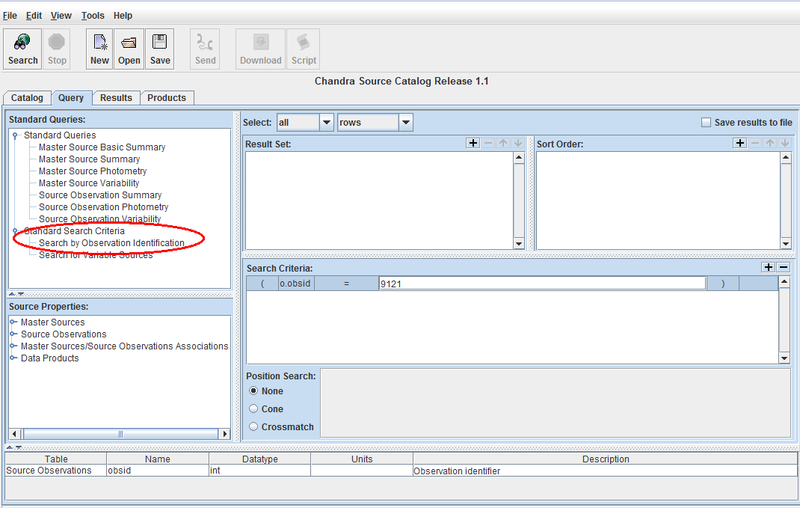 If there is an unrealistic mix of search conditions specified in a CSCview query, or a particular criterion is too restrictive - e.g., a flux threshold value was set too high or the cone search radius was set to too small a value - it is possible to miss your source in the catalog. If you suspect this could be the case for your query, try relaxing the search criteria and/or reducing the number of search restrictions to see if this helps to turn up your source. CSCview help documentation and threads are available on the CSC website to guide you. The most fun way to verify if your source is included in the catalog is via the CSC interface to Sky in Google Earth, described here with an accompanying tutorial. 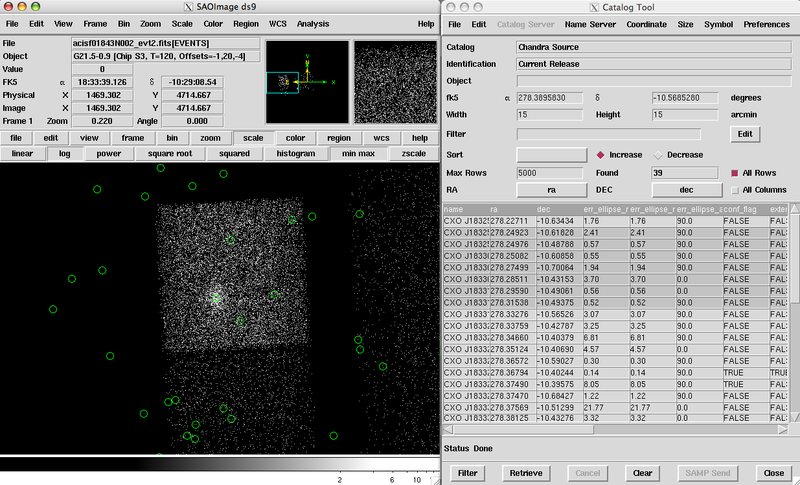 This service allows you to visualize Chandra observation fields of view on the night sky, with a clear distinction between those which are and are not included in release 1.1 of the CSC. 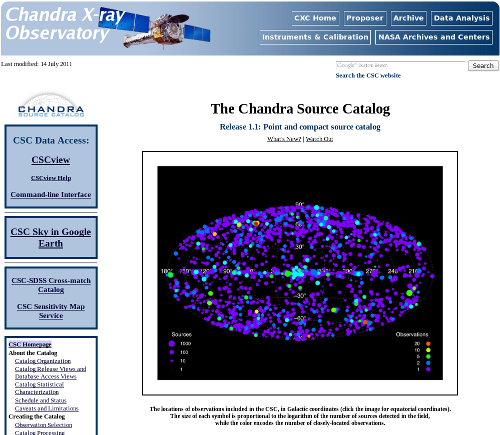 Searching Sky by source name or coordinates is a quick and easy way to learn if a Chandra observation of a source is included in the catalog. 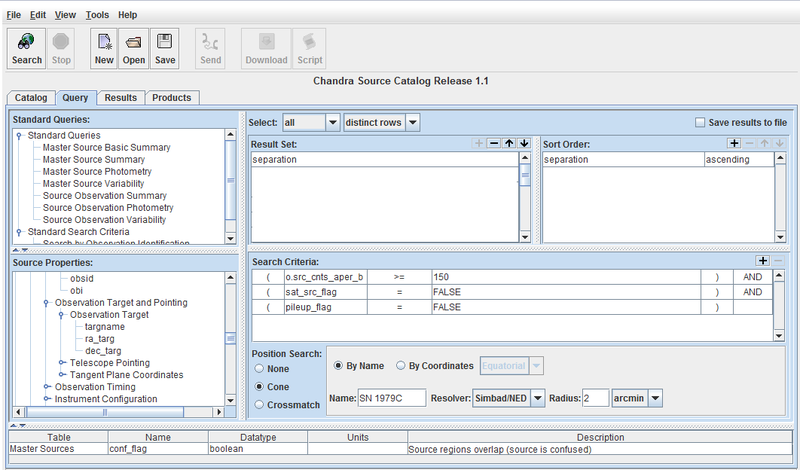 CSC data may also be imported into the DS9 applicatation using the Catalog Tool (versions 5.6 and above), for another way of determining if your source is included in the catalog. 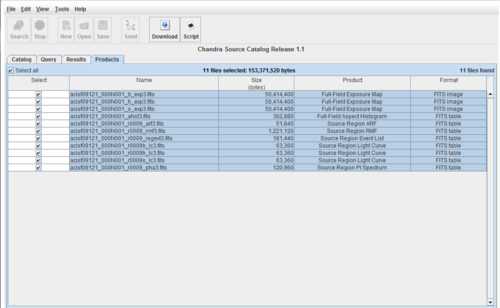 Among other capabilities, the DS9 Catalog Tool can load tables of CSC data according to your input search criteria, and overlay circular source regions on your uploaded image for all sources returned by the search. The CSC may be accessed with the DS9 Analysis -> Catalogs -> High Energy -> Chandra Source menu item; see the CSC thread "Accessing the CSC with DS9 and TOPCAT" for further instruction. 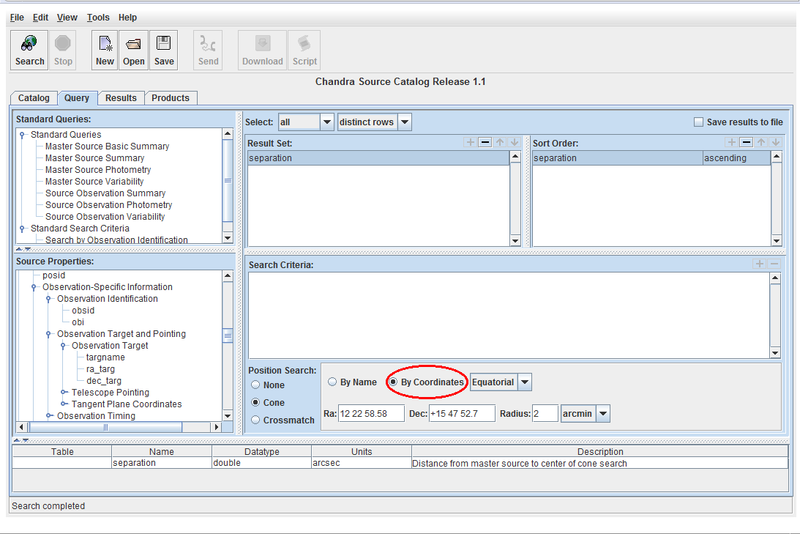 If you can verify that your source is included in the catalog with one of the options described above, but you are not able to locate it using a CSCview query, you should contact the CXC Helpdesk for assistance.